In January-February 2018, nearly 50 monastics from six countries attended the Living Vinaya in the West course hosted by Sravasti Abbey. The course was a follow-on to the “Life As a Western Buddhist Nun” course co-organized by Venerable Thubten Chodron in Bodhgaya in 1996. Venerable Bhiksuni Master Wu Yin, Abbess of Luminary International Buddhist Society in Taiwan, taught on the Vinaya (code of monastic discipline) as she had in 1996, traveling to the United States for the first time in many years. Participants explored how to establish flourishing monastic communities in modern society through discussions, role-plays, and other group activities. They also participated in monastic rituals at the Abbey, including the ordination of Venerable Thubten Lamsel. Living Vinaya in the West, a course on monastic discipline for Buddhist monastics from all traditions, concluded a few days ago. 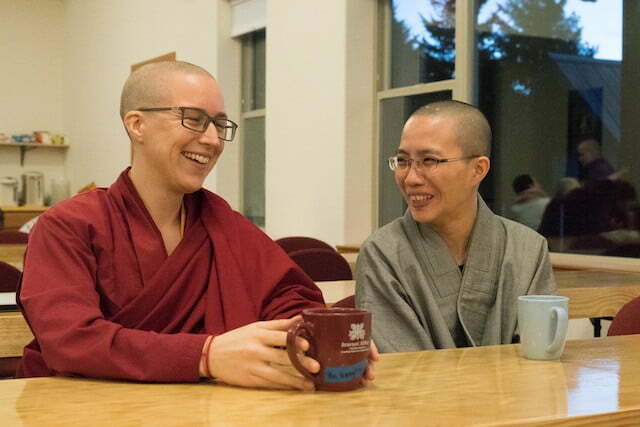 If I had to use one word to sum up my experience, it would be gratitude – for Venerable Thubten Chodron’s efforts to establish Sravasti Abbey and the first generation of pioneers who brought the Dharma to the West. Until this course, I didn’t understand how much living in a monastic community could influence one’s ability to practice Buddhist precepts. But listening to the alternative lifestyles of other participants was quite sobering. Fragmentation and uncertainty characterized many of their situations. Many talked about having to rely on savings and governmental support to cover their basic requisites. 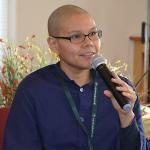 Some lived near other monastics but communal schedules, activities, responsibilities were difficult to arrange. The monastic model may be new to the United States, but Sravasti Abbey provides an example of how it can be done. No doubt, it would not be here without Ven. Chodron’s vision and merit from a lifetime of devotion to the Three Jewels. But the question for future generations is how to preserve the knowledge and leadership abilities of senior monastics so places like Sravasti Abbey are sustainable. One way this might be done is by targeting Dharma outreach to younger and diverse segments of society to raise awareness and interest in the monastic lifestyle. Supporting the availability of Vinaya teaching materials will ensure new monastics have adequate training, such as the Abbey’s recent publishing of six booklets on Vinaya rites and rituals. Newer sangha members can talk to senior members about what worked, what didn’t, and opportunities and challenges on the horizon. But the biggest way we can contribute is through our own Dharma practice. Leaders are built from the ground up in monasteries. All those who come to train at the Abbey are encouraged to keep their minds and hearts open to receiving constructive feedback and are assigned tasks with more responsibility as they progress in learning and practicing the Dharma. Under the guidance of caring mentors and senior community members, junior monastics develop leadership abilities by practicing the six perfections of fortitude, patience, ethics, joyous effort, concentration, and wisdom. As I ponder this question, one answer is certain – the enormous contribution of the first generation of Western Buddhist pioneers is too precious to lose. Now is the time for future generations to step up and ensure the continued flourishing of Buddhadharma in the West!